If NDP Leader Tom Mulcair wants to make laws as prime minister, he will need senators whether he appoints them or not, which raises a number of practical and procedural questions. Would Tom Mulcair, if elected prime minister, grin and bear his government's throne speech being delivered in the Senate — or try something new? NDP Leader Tom Mulcair is unequivocal: "I'm not going to name senators. The NDP is not going to name senators." His pledge, made in an interview with CBC chief correspondent Peter Mansbridge — along with Mulcair saying he would expect the Senate to rubber-stamp work done in the House of Commons — offers the first glimpse of how Parliament might function with an NDP government. Mulcair has called the Senate unaccountable and undemocratic, labelled senators party hacks or bagmen and said Senators "do nothing of use to this country." The thing is, if Mulcair wants to make laws for the rest of us, he will need senators whether he appoints them or not, which raises a number of practical and procedural questions. 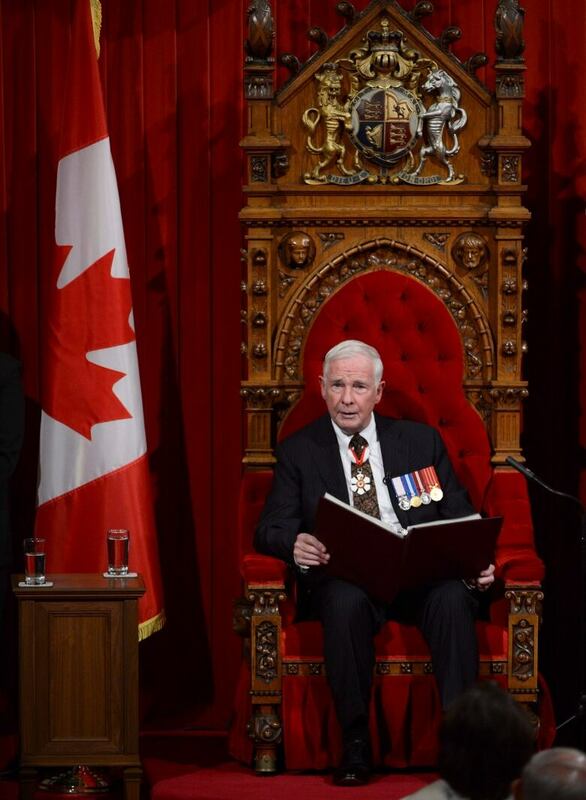 Where would Mulcair want the Governor General to read the speech from the throne? Every new session of Parliament opens with a speech from the throne that sets out in broad terms the government's plans for Canada. The Governor General reads that speech in the Senate. There isn't a rule that says the speech has to be read there, but it is a long-standing convention. The practice started in England after a dust-up in the House of Commons in 1642 when King Charles I tried to enter the Commons to arrest some MPs. Ever since, Parliament has recognized the rightful place of the monarch or her representative in the upper house. The only exception in Canada happened almost 100 years ago when Parliament convened for the first time since the great fire of 1916 razed Centre Block. With the Red Chamber still under construction, the Senate occupied the House of Commons on the first day. 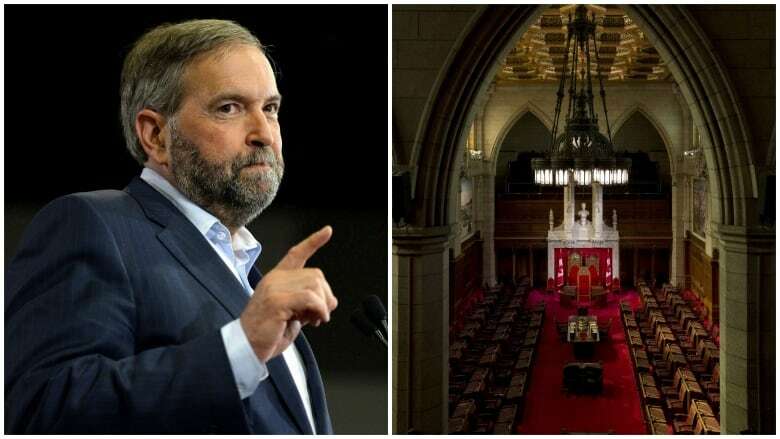 For Mulcair, a speech from the throne in the Senate would be a problem of optics. Does he grin and bear a long-standing tradition or try something new? Sticking with the pomp and ceremony in the Senate could show Mulcair is focused on getting to work and not sweating the small stuff. On the other hand, it would certainly look odd to have the first ever NDP government, a party that has long campaigned on Senate abolition, to kick off a new Parliament in the same old fashion. 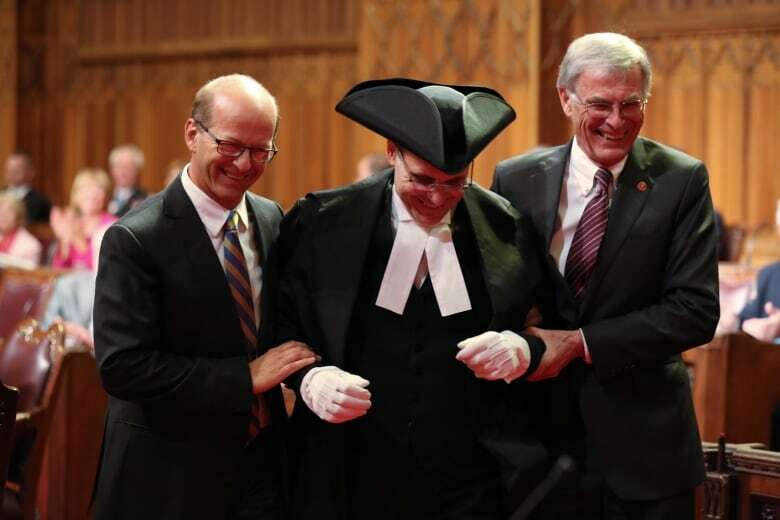 There is no legal requirement for the prime minister, through the Governor General, to appoint a Senate Speaker, but there is an institutional requirement for someone to wear the tri-cornered black hat. Technically, the Harper appointee Leo Housakos would still be on the job until or if another prime minister replaces him. Would Mulcair want to keep Housakos on the dais? The Speaker has an important job in terms of getting things done in the Senate. Among other things, the Speaker rules on questions of parliamentary procedure, maintains order in the Senate and presides over votes. The Speaker also receives diplomats, regularly represents the government at events of national importance and receives counterparts from foreign legislatures. The Speaker's role is not as partisan as it once was. Mulcair could appoint an existing senator, someone he feels is relatively non-partisan, capable and respected by their peers. How that jibes with his previous assertions that the Senate is packed with failed partisans and layabouts would be his problem to explain. "In an era of hyper-partisanship, and that's become normal now, you need a Speaker to apply the rules," says University of Manitoba professor and Senate expert Paul Thomas. With 22 current Senate vacancies and more on the horizon, Thomas says Mulcair could find the place filled with Harper loyalists and face stalemates when it comes to achieving the goals of his party. Things would get truly bizarre if Mulcair chose not to make anyone Speaker, says Dan Hays, a retired Liberal senator, who served as Speaker from 2001 to 2006. He says that without a Speaker, the Senate would likely organize itself to act independently. "The Senate could elect one of its number to solve the problem, but that person would not be able to fill all of the constitutional roles envisaged for that position," he said. In order to push a legislative agenda through Parliament, governments have always had a leader in the Senate. It would be much harder to deputize a Conservative, Independent or Senate Liberal to do this job. The leader of the government introduces bills, speaks for the government during debates on proposed legislation and answers questions on its behalf during the Senate question period. "Senators have to address the business coming before them, and that comes largely from the government. Somebody has to have some kind of responsibility to articulate the government's priorities," said David E. Smith, a distinguished visiting professor at Ryerson University who is widely respected for his knowledge about how Parliament works. The government leader has always been an influential and crucial position. The Senate doesn't run on autopilot, and it needs inter-party co-operation. The person in that role also serves as the prime minister's eyes and ears in the Senate. The leader reports on timelines for passing legislation as well as the mood in the Red Chamber about how contentious legislation might be received. In his interview with Mansbridge, Mulcair said the Senate would be "given legislation and asked to pass it in turn so that it can be promulgated into law." Being told to ignore their constitutional role in the house of sober second thought would cause many senators to take exception. "I can understand what he says, but has he not read the Supreme Court of Canada opinion? How does he reconcile what the Supreme Court says, that the Senate has a fundamental role to play in the creation of legislation and its enactment?" Smith says. Hays says the Senate, with powers equal to the House of Commons, would probably proceed in the same fashion regardless of Mulcair's instructions, with debates, committees to study bills and amendments when it feels necessary. Politically, that strategy might serve the NDP's interests in the case of a slim, shaky minority government, where it might be expedient for the government to arrange its defeat by blaming the Senate of obstruction. In any other scenario, the government must organize itself to execute its legislative plan. If Mulcair wants to pass a budget or bill to bring in $15 daycare, creating logjams by not using the procedural tools at his disposal in the Senate could backfire with the Canadian public. "If these are major planks in your platform and you get the mandate to implement them, and you say you can't get it done because of the decadent Senate, that's a weak argument to me," says Thomas. Alison Crawford is a senior reporter in CBC's parliamentary bureau, covering justice, public safety, the Supreme Court and Liberal Party of Canada.